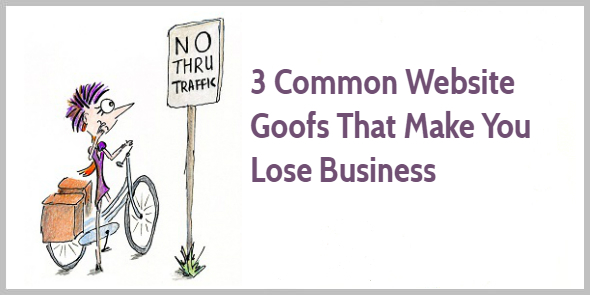 Do These 3 Website Goofs Make You Lose Business? The theory for great websites seems simple enough, right? You create a good-looking design. You tell people what you offer. You demonstrate your knowledge and skills on your blog. And when web visitors arrive the till starts ringing; the dough rolls in. But why don’t our websites work like that? Why do most web visitors bounce away and never come back? You clean your bicycle chain, and check your brakes. You get the most up to date guide for hotel and restaurant recommendations, a detailed route description, and a map. You’re ready to set off for your 400-mile adventure to Santiago de Compostela, Spain. Despite a flat tire, a broken brake cable, a long detour, a closed hotel, and the exhausting heat, you arrive in Santiago two weeks later. Your legs are exhausted. Your back is hurting. And your bum is sore. But … you arrive with a smile on your face. You made it. Website visits are like that bicycle trip. But while you were committed to get to your destination no matter what, your web visitors are less patient. Unclear directions make them turn around and click away. And that’s when you might lose them forever. So how can you create a smooth journey for your web visitors? How can you get them to subscribe to your list so you can nurture a relationship? And how can you persuade them to contact you, hire you, and buy from you? Let’s look at the most common mishaps sending web visitors stumbling around. Avoid these 3 common mistakes and you’ll have happy web visitors with a smile on their face. They read your content, send you inquiries, and buy your products. Ever had to lug your bike up a flight of stairs because the only way to cross a road was to use a footbridge? But the same happens on many websites—they assume every web visitor is the same. But it’s like treating cyclists like pedestrians. Web visitors are on different journeys because they’re at different stages of the purchasing process and their aims vary. Some web visitors know who you are. They’re reading your blog almost every week. All they want to do is read your latest article without popups obscuring their view. Other web visitors don’t have a clue who you are. They have a problem—perhaps they feel overwhelmed and don’t know how to market their business; or they simply want to know how to format their book for Kindle. They’ve googled their query and arrived at your site. You give them the information they need and invite them on a journey of exploration—perhaps by suggesting related content or encouraging them to join your list. Yet other web visitors have just found out who you are. They read your latest guest post and clicked on your author byline to find out more. They’re ready to join your list. When writing web content, consider who your reader is and how much he knows about who you are and what you offer. Give him the right content at the right time. It was 2010, and we were cycling newbies. We undertook our second cycling adventure in the UK: a 4-day trip from Swindon to Cardiff. We’d done fine on our first two days, but the third day would be our longest cycling day. We set off from Bristol in the morning, aiming to reach Newport in Wales. We crossed the famous Clifton Suspension bridge and enjoyed pedaling along the Avon river. It wasn’t even raining. But soon our journey was rudely interrupted. We had to cross a motorway, but … the bridge was gone. We stared at the cars speeding by, down below us—we had no clue how we could get to the other side. No diversion was indicated. A big difference exists between cycling adventures and website journeys. A cyclist wants to reach a destination, but that’s not her main aim; it’s about the journey, and obstacles and hardship are part of the experience. Your web visitor, however, has a well defined aim—he wants to buy a product, check whether you might be the right coach for him, or simply learn how to get started on Twitter. Your web visitors hate obstacles and hardships; they want to reach their destination as quickly as possible; and that’s why they need clear signage so they know where they’re going. Our job as site owners is to show web visitors where to go next. After reading your About page, for instance, consider the next logical calls-to-action. Perhaps join your email list, read your favorite blog posts, or check out your product offer. Don’t let your readers get stuck. Instead, build bridges and show them where to go next—every step of the way. On each of my cycle trips, it happens at least once. We miss a sign post and take a wrong turn. Worst case, it means a 10-mile detour, exactly on the day you’re exhausted and most looking forward to a warm shower, a good meal, and resting your legs. You might think the sign posting on your website is clear, but your web visitors are in a hurry. Might they misunderstand your directions? Don’t make readers guess what’s behind a link. Give them clear directions to reach their destinations. Each web page is part of a web visitor’s journey. So think about your web visitor. Who is he? Where is he arriving? And what would he like to do? Create dedicated paths for cyclists, walkers, and cars. Show each of them how to get to their destination. And make their journey pleasant. PS Thank you to content strategist Mark Crosling for inspiring this article. Again you manage to insert your passion for cycling in an article about writing. And again it fits perfectly. It’s good advice by the way. Not showing your reader where to go next is the number one sin, I see on many websites. Including mine from time to time *ahem*. I’m glad you enjoyed this article even though you don’t like cycling. Thank you for stopping by again, Chris. I appreciate it! Another great ride…er…read, Henneke. 😉 And so much more interesting than the typical “mistakes” post. Enjoyed it. Henneke, yes, I have been making the course too difficult, but not by design, but rather by not realizing all these truths you have shared. Not, that I’ve never read all the many important facets of a Website, but that while I was designing my site, I’ve not realized the purpose, from the visitor’s viewpoint. It’s not easy to think from your visitor’s point of view – especially as different visitors look for different things. I’ve also found that websites tend to grow and can become unwieldy. It’s also time for me to review how to make an easier web visitor experience; it’s probably pretty good for long-time friends, but might be quite overwhelming for new visitors. Always good to see you, Katharine! How do we “consider who your reader is and how much he knows about who you are and what you offer. Give him the right content at the right time.”? Is it about where they land, such as if they are on the “about” page, of course, they are probably new, but if they are deep into heavy stuff, probably they are needy, etc.? On many pages you need to cater for people at different levels. For instance, on a home page everyone mixes, so you’d need to have different calls to action for different people. Same for your About page. This is probably the best description of this topic I’ve read. I love the metaphors and references you made with cycling because that helped me see things clearer. The unclear signage is a biggie for me. I’ll be paying close attention to that. What I also didn’t know was the logo on the left as opposed to the middle. I’ll have to look further into that definitely. The research into logo placement is quite interesting, isn’t it? I hadn’t thought it would make such a big difference between a top left hand corner and a center placed logo. That’s a great analogy, Henneke. It makes what you are telling me so clear and memorable. I’m going to go and look at each page if my website and imagine it as a landing page, then think how to help my visitor move on from there. Telling them their ‘next step’ means they are more likely to take it! Yep, that’s it! Each web page is like a landing page where people arrive, consume content and then move on. Always good to see you, Alison! I really like your cycling analogy, I can feel the pain of the obstacles. 🙂 Writing for different levels of awareness is a big eye-opener for me, although it’s a painfully obvious concept. Lord knows I need to do a better job with signage and smooth flow of my site, but I guess I can’t assume everyone knows me and loves my products…. dang it! 😉 Time to go take a look at my site with new eyes. Thanks for the great (and easy to understand) checklist. A lot of marketing and copywriting advice seems to be focused on the people who are almost ready to buy. But I’ve come across less information about what to do for people who aren’t ready yet (and those who have already purchased!) – while they are important, too. I found that getting specific with navigation titles (not just what everybody else does), offering related content suggestions throughout posts, and segmenting my email list into 3 groups according to their present situation helped to get the best performance out of my website. I love it when you talk cycling to me! And I don’t even own a set of wheels at the moment. Your stories give me the charm of a vicarious adventure and help me build my business muscles along the way. Win-Win. Building your business muscles … I like that! In an age of “computer people” thinking we should all be at the same level of understanding when using our machines or navigating a website, your post is a breath of fresh air! If I have to guess my way around a website to click on a hidden link that “everyone knows it works like this,” I simply leave. It’s not worth the hassle. Great post, Henneke! And amusing as well. Thanks for the smile. And yes, many websites are confusing and unwieldy, and most of us get impatient. Thank you for stopping by. I appreciate it. I like how you made the comparison between your cycling adventures and creating the best user experience for our website visitors. That was cool. And helpful. Goof #2 is perhaps an overlooked area. It’s easy to classify a CTA as being conversion-focused when it can simply be an explicit instruction for the next step. Thanks for your clear instructions! Yep, so true – a CTA can be anything from check out this case study to read these blog posts, and from buy now to download here. What a lovely comment, Donna. I’m glad this blog post came at the right time for you. Good luck with your new website. Let me know if you have any specific questions? This post came at a perfect time! I have been thinking of changing up my website because it doesn’t have a clear direction of where to go when they reach the main page (or any other page for that matter). The comparison to bicycling really clicked for me. I’ll be working on my changes so I keep people on my site. Thank you! Good luck with updating your website! Excellent advice. A quick enjoyable trip to what you want with fun and goodies on the way will always be something one will come back to. Passing it on to my young web content developer and web page designer friends in India and Pakistan. Great! Thank you for passing it on and spreading the word, Nicolas. I appreciate it! A wonderful post Henneke that takes the reader on a journey sprinkled with solid advice. Importantly, thank you for the mention in inspiring your post. I’m very touched. I got some of my students to road-test my fiction-writing blog. I figured if 16-year-olds could navigate to a specific thing, then most other users could too 😉 It’s important to remember that just because we know where things are, it doesn’t mean other people do unless we make it obvious!